StartDock embodies what coworking is about; collaboration over competition, standard friday afternoondrinks together, visiting eachother's birthday's and living as a warm community of likeminded start-ups that help eachother grow. At StartDock, worklife is better. We want start-ups to naturally grow fast, by sharing and caring. StartDock houses enthusiastic entrepreneurs, willing to share their thoughts, resources and network. By paying sincere attention to your neighbours, you might be able to help them with their problems. By sharing your problems, your neighbours might be able to help you. You alone can do it, but you can’t do it alone. Do you want to grow your start-up in the best environment possible, on the best location in town? Join us, you are welcome! Are you a member of StartDock? StartDock is one of the most inspiring places I have ever been to. The StartDock team makes a real difference, and the beautiful building speaks for itself. It is awesome to see how a community creates added value to each other, in the way that the StartDock community does this. 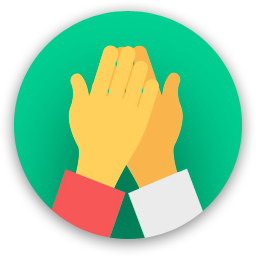 every person inside StartDock is willing to help other, and since no competition is allowed in the building, they all add significant value to each other. It is a very productive and inspiring environment to work from, but the expanding of your network is a value that people should definitely not forget. I would wholeheartedly recommend this coworking space as the best space in Amsterdam! I started flex working at Startdock when I was only 18 years old. I didn't had a lot experience, but the enthusiastic people of Startdock really helped me a lot and learned me everything about networking and about what it means to start your own business. I've only had my flex working space for something like 6 months (I unfortunately didn't had much time to go) but still I'm sometimes in contact with the Startdock community. Even tho I'm really busy and I haven't seen them for a long time they keep inviting me for events and stuff like that. I guess it's once a start docker always a start docker. "Best co-working space I have ever worked at. " Startdock has this amazing location at probably the best spot in Amsterdam. Right next to the "Gouden bocht". As a startup you don't have a lot of colleagues in the beginning. That's when a community like Startdock is a perfect match! You get to know everyone inside Startdock as if they are your colleagues. Lunching together. Drinking beers together on friday. Talking about getting more customers. Learning from the scale-ups inside the building. All benefits of joining this amazing community. In the summer there is the opportunity to use the 'Startdock' boat and tour the Amsterdam canals together. Truly an amazing place to work. When I arrived at Startdock I get a very warm welcome and a (good!) cup of coffee. The team asked me to stay for lunch and they are all day available for questions. I've booked a desk or a meeting room several times now. You just plug in, connect with WiFi and you can start. The drinks are free all day long and during lunch you meet more young entrepreneurs. This is a good way to meet, brainstorm, socialize, learn, discover, explore and also have a good time in the common area after working days. Startdock is the answer for every startup! For my business, Startdock has been the best co-working space I could wish. Startdock offers al really nice workplace with a lot ot enthousiastic entrepreneurs! The community is close and Startdock offers several great events to connect with the co-Workers of to Get inspired. The founders of Startdock are always willing to help with your business and they strongly believe in their vision for Startdock, which I admire. It’s such a good team! And of course...., the location is the definition of perfect. Among the Amsterdam canals it is a pleasure Every day to go to Startdock and enjoy the surroundings. These guys know what coworking is all about. Crazy warm atmosphere, lovely building, awesome facilities and plenty of enthusiasm. I went to StartDock on my trip to Amsterdam and it directly felt right. The price was very affordable, and I got back a lot of knowledge, connections and lovely conversations. The fact that this community exists of mostly young entrepreneurs, works inspiring. All the other spaces I visited in other countries and cities, missed the vibe that StartDock actually has. If you are in Amsterdam as a foreigner, and looking for the best place to stay, definitely pick StartDock's space! "Great spot with everything you need for productive workdays"
StartDock is a wonderful co working space in the heart of Amsterdam with the nicest and brightest people, amazing views and fun events. They offer excellent facilities such as a great daily lunch, coffee and tea, impressive meeting rooms, fun and educative events. There's a really helpful and friendly community and a very relaxed atmosphere. The people are fun to hang out with and you can count on some good conversations when you walk in. Also, as you're all probably dying to know: the coffee is great! All in all, would definitely recommend: it's a great spot with everything you need for great workdays. Do you aspire a good work/life balance? Well, at StartDock you’ll get the whole package. With a great communal vibe which gets enforced by the young but professional team through lunches and the famous Dutch “VrijMiBo”, the life part of work/life is certainly there. The work part is also really good. StartDock offers different types of desks which are all great to get your work done. The rooms are not too big or too cramped, so you don’t have the feeling that you’re like sardines in a can. Overall I would recommend the space to everyone searching for a place to feel at home and getting your things done. I am part of the StartDock community for two month now and so far my experiences are more than positive. Some of my favorite things about this place are its beautiful building located in the very lovely neighborhood, cozy offices, and nice atmosphere. Beside this, for me, the best part of StartDock is the community itself. I have the pleasure to share this space with so many young, interesting, warm and welcoming people working together, sharing ideas and supporting each other. Sooo, I would like to recommend StartDock to anyone looking for an inspiring, productive, friendly and cozy environment for their business! "StartDock is thé coworking space where community comes first! It's an excellent environment to boost your own ideas and business by being inspired by other hard working entrepreneurs." StartDock is one of the most inspiring places I have ever been to. The StartDock team makes a real difference, and the beautiful building speaks for itself. It is awesome to see how a community creates added value to eachother, in the way that the StartDock community does this. Every person inside StartDock is willing to help others, and since no competition is allowed in the building, they all add significant value to eachother. It is a very productive and inspiring environment to work from, but the expanding of your network is a value that people should definitely not forget. I would wholeheartedly recommend this coworking space as the best space in Amsterdam! I was at Startdock for many times at different events. I always had an very interesting time there. I even came in touch with a company that could help me with a new website for my association. I would never have achieved this without the incredible Stardock community. At Startdock you are always warmly welcomed. Inspiring events, nice business lunches. Startdock is a place where you can meet alike business people. I would always recommend startdock to interested parties. They have cheap desks. They grow very quickly in Amsterdam. I love this place, especially when they have the beers cold! "Big rooms with not too many desks and great coffee!" I love to go by bike to StartDock every morning. The city is really beautiful (and still quiet) and I like to watch the old canal houses. When I arrive at StartDock, I first start with a cup of coffee and then it is just plug and play. I personally enjoy the premium desk, because you have a lot of space and all the facilities are included! You have unlimited coffee and tea, able to use the meeting rooms, a quiet room to work & at the end of the afternoon you can socialize with like minded entrepreneurs in the common area (and play some darts ofcourse). "Nice people, great location, great atmosphere!" Stop looking for a perfect location, this is it!! The team is young and professional. They assist you with everything you want or need. The other co-workers are also very kind. You have a very productive environment to work in, but you can also enjoy from the social benefits the location offers (like the VrijMiBo). The location is beautiful in the city centre of Amsterdam. You have a pretty view on the canals. So it is a very unique opportunity to work here. The wifi is very good, you will never experience problems. I would recommend this top location to everyone. "Great looking place in the city center of Amsterdam"
If you are searching for an affordable great looking place to get your work done in the city center of Amsterdam, StartDock is the place to be! 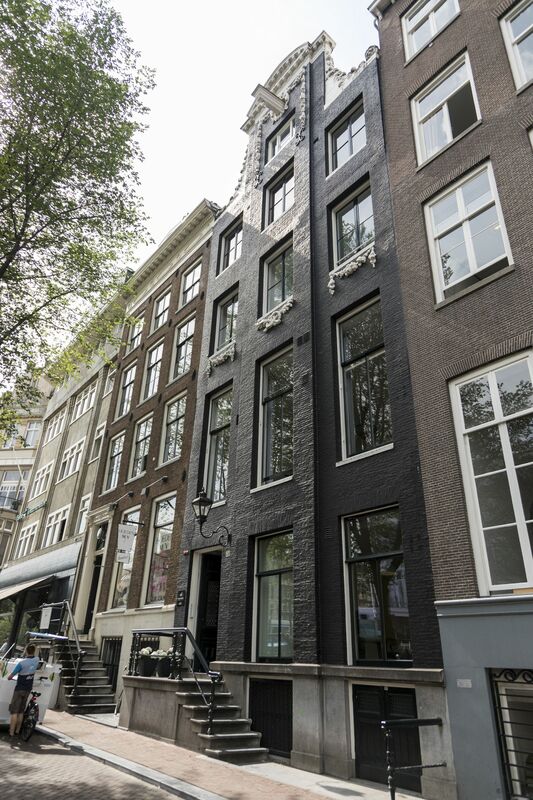 Located at the Herengracht next to Koningsplein the situation of the building can’t be any better. I think that StartDock offers a great mixture between workplaces and a vibrant community. For example, during the lunch I was able to meet with a lot of other tenants (or Dockers as they call them) and discuss with them my business and get to know more about theirs. Looking for a place with a great social and business vibe? Look no further, StartDock is the place to be! "A fantastically creative space for creative people"
I have not been at StartDock for long but in the time I have been here I have been super impressed at the level of collaboration and the friendliness of the creative people that work here. 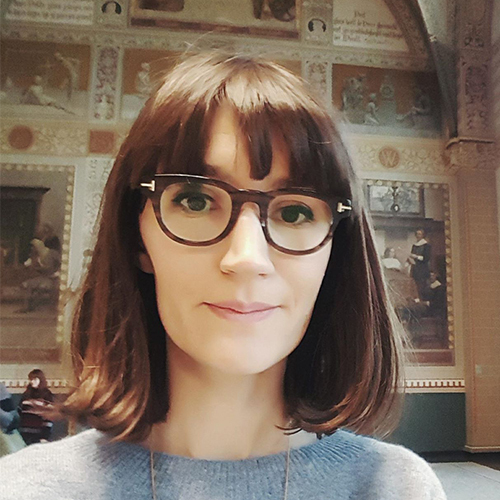 I recently moved to Amsterdam and StartDock has been a fantastic place to share ideas, collaborate on work and meet new people. Your are made to feel welcome right away, everyone has lunch together and there are regular social events to get people talking - the location is unbeatable. I highly recommend StartDock for anyone looking to work in a creative and collaborative environment. "The best place to work in town for an entrepreneur or freelancer while having a lovely time in a warm environment"
"Best environment to create, innovate and share experience with like-minded people"
It's been almost a year I'm working from there and everytime it's like coming home. Very smart people there with whom we can exchange experience. As a French expat creating my company in the Netherlands, it was nice to end up in a co-working space like startdock where there is a real communication with other entrepreneurs. Also the place is women friendly and they are really willing to have more women entrepreneurs. They find the good balance between the family atmosphere and the working one. 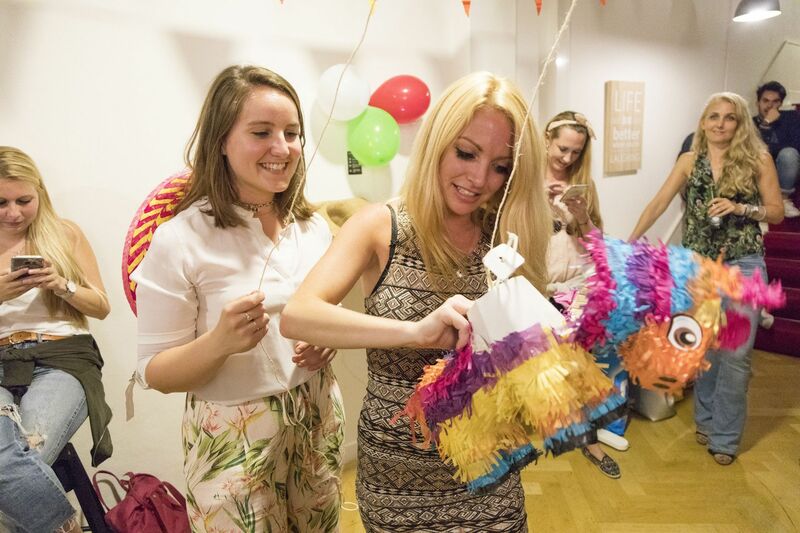 It's easy to focus, create and innovate and then relax and have fun together with your co-workers. "Best social atmosphere in a working place i've seen so far"
"A ‘must go’ corworking space in the centre of Mmsterdam! " I’ve been to StartDock severall times and the place keeps surprising me with all it’s beauty. I was able to reach StartDock by public transport, which was only 35 minutes from my house. When I entered the building, I felt this awesome community vibe overwhelming me. What I found really exciting about StartDock is the community, since everybody in this community is so eager to help and open to eachother. Next to that, StartDock is located in the very heart of the city centre and the workspots in StartDock are very affordable and nice. What’s funny, is that StartDock has a rule that tenants may not compete eachother, which brings everybody a great amount of business due to the network. Besides StartDock has it’s own boat, and in summertimes they use this at least once per week. To conclude this, I would totally recommend StartDock to any person who will read this review. "StartDock, a great place to work!" When I first arrived at StartDock, I received a very warm welcome from the team and tenants! They invited me to the daily lunch (which was great) and I met some nice people. What I really like is the Marco Polo meeting room. 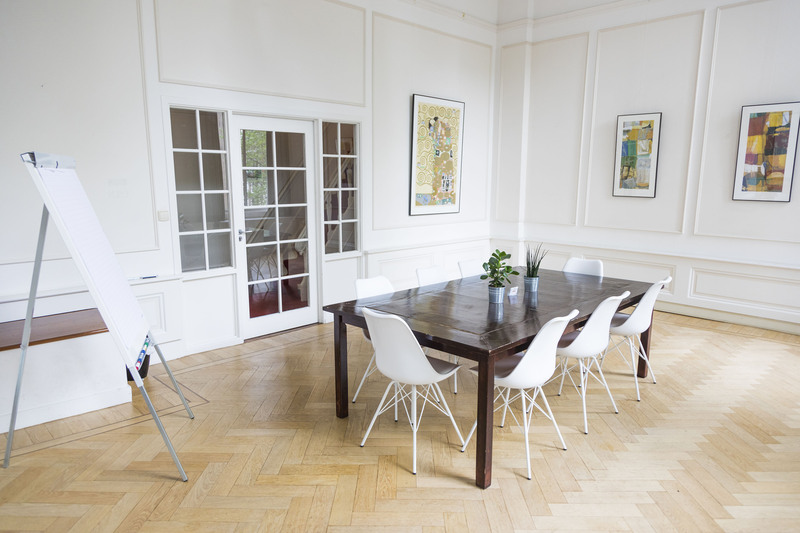 This is a classical meeting room with Herengracht canal view. The view is amazing and I feel really comfortable when I meet clients in the Marco Polo meeting room. What I also like is the coffee at StartDock (from the coffee company Lot Sixty One). So it is a unique opportunity to work at StartDock. The wifi is very good, you will never experience problems. I would like to recommend StartDock to every freelancer and startup! "The warmest and most comfortable coworking space there is! " Startdock keeps surprising me everytime with all it’s beauty and incredible vibes. The exclusive location in the very heart of the center of Amsterdam gives you already that unique feeling to be really proud of the place you’re working at. When I entered the building, i felt blessed to walk through all those spaces where almost 400 years ago people were walking too! In addition you see and feel the modern start up vibe right away. It is a really warm and cosy space with an awesome community vibe. What I found really exciting about StartDock is how everyone in the community is so eager and open to help another “Docker” .At every event I’ve been to, everyone seems to have always a lot of fun with each other and are really enthusiastic to meet new people. Next to that, the Startdock community is really warm and makes it possible to feel as if you’re working from your own home, but with all the benefits and facilities of a real office space. The workspots in StartDock are very affordable and it’s definitely the best investment in every startup. What’s even better is that StartDock has it’s own boat, and in summertimes they use this at least once per week. StartDock is familiar and warm because of it’s close community, what you directly feel when you’re in this community. In conclusion I would definitley recommend StartDock to any person who searches for the warmest, cosiest and funniest coworking space there is! Working spaces are comfortable, well sized. You can easilly find a spot to concentrate or get connected with others. The building is beatifull, historic. It's a good location to invite guests and meet. It's easy to get in contact with other people, you will be surprised how useful these contacts are for your business. I met several people with great networks which appeared very benificial for my business. I think Startdock is a good initiative to improve your business and network. The hosts are well infrormed about Amsterdam and a wide range of business areas. It seemd to me they are always willing to share ideas or challenge my ideas. The only 'thing' is parking. But what to expect from downtown Amsterdam. "The best co-working in town!" Startdock is one of the most inspiring places I have ever been to. The Startdock team makes a real difference. It is awesome to see how a community creates added value to each other, in the way that the Stardock community does this. Every person inside Stardock is willing to help others, and since no competiton is allowed in the building, they all add significant value to eachother. A example of the close community is the events some of the Dockers are organizing, like the Friday afternoon drinks or the movie nights. A great initiative of one of the owers, Thom, is Feedback Friday, the Dockers can give feedback and help eachother further. This community works very hard to let their and your business grow, but also wants to enjoy the journey . I would definitely recommend Startdock if you feel the same way! When I arrived at StartDock, I received a warm welcome from the team ! They invited me to the daily lunch and I met some interesting people. They also organize periodic meetings went for all residents to share knowledge and experience. What I really like is the Marco Polo meeting room. This is a classical meeting room with Herengracht canal view. The view is amazing and I feel really comfortable when I meet clients in the Marco Polo meeting room. So it is a unique opportunity to work at StartDock. The Internet is fine. I recommend StartDock to every freelancer and startup! Lovely, smart, living with their mind in 2018 (not in 1990) and happy people. They organise lunches, inspiring colleges, interesting conversations and good parties. As one of the first residents of Startdock I am beyond happy and proud to call this my office. This place is also good for your network and business, I found my first big client over here. Beside that the community is very warm and always open te help you out with everything. The location of the office is also very good. In the middle of the center next to a super market, bars, other coworking spaces and canals. Big thumbs up! "An Amazing Space with great people." As a new business owner from Africa I was, at first, a bit lost in the big entrepreneurial world and the new Citu! Looking around in the different coworking spaces, provided by Amsterdam, StartDock was the one that really made me feel at home and in a “save haven”. Having a lot of entrepreneurs around you that are happily wanting to share their experiences with their business really helps you in setting up your own company when you are lost. Furthermore, the Friday afternoon drinks are a great way to meet your coworkers in an informal way. Looking for a place to safely grow your business in company of like-minded people? Choose StartDock! It is certainly on the list of my best decisions since moving to the Netherlands! I’ve been to StartDock a few months now and the place keeps surprising me. I was able to reach StartDock by public transport, which was only 10 minutes from my house. What I found really exciting about StartDock is the community, since everybody in this community is so eager to help and open to eachother and the events, that are always full of very enthusiastic people who sincerely are having fun together. StartDock has it’s own boat, and in summertimes they use this at least once per week and I'm looking forward to join! The most people in this Coworking space are young, which only make the VriMiBo more epic. "Fell in love with this place <3"
That feeling when entering a building, you directly know that this is the right spot for you to work from. Obviously, I never had this feeling before, but in StartDock this just felt right. The people are so warm, the building is so beautiful and the location is just phenomenal. 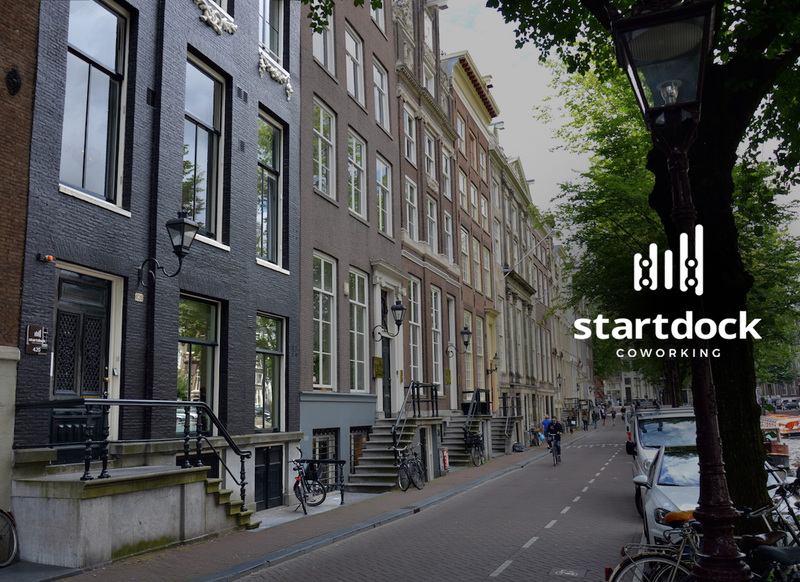 A great mix of productivity, atmosphere, fun, lovely people and driving your Amsterdam City Bike with a big smile to your workspot, makes StartDock the right place to work from as a start-up, freelancer, entrepreneur or upscaling company. You should not doubt, I would recommend this place with all I have! "Beautiful location in the heart of Amsterdam (with a boat!)" StartDock is definitely the place to be if you want to meet like-minded starters who help each other to accelerate their business! The "rule" actually is that co-workers can't compete with each other, which results in a very friendly atmosphere. It is beautifully located in the heart of Amsterdam, and easily reached with public transport. Talking about transport, have you seen that boat?! Having been here a dozen of times now, I can definitely recommend it to other entrepreneurs who want to be in an international and fun environment. Lastly a shout out to people running the place, who make sure from the very start that you feel welcome! "StartDock the place to be for Startups." StartDock is a community/coworking place for young startups who help each other with their businesses. It is located in a beautiful, monumental building in the lively city centre of Amsterdam with shops, restaurants and theaters. I have been there several times and must say that StartDock is easily accessible by public transport. The founders of StartDock are young and enthusiastic entrepreneurs, helping the tenants to feel at ease, get to know each other by organizing joint lunches, drinks at the end of the week, boat trips during summertime through the Amsterdam canals in the StartDock boat and during lectures and events in the beautiful event/meeting room of the StartDock building. This room can also be hired by third parties for events or meetings. I recommend StartDock to anyone reading this review. My best friend works at this place and it's a great place to co-work. It has all the facilities you need, there is room for business and for fun, but the most important thing is: you'll find a good vibe with other likeminded people! 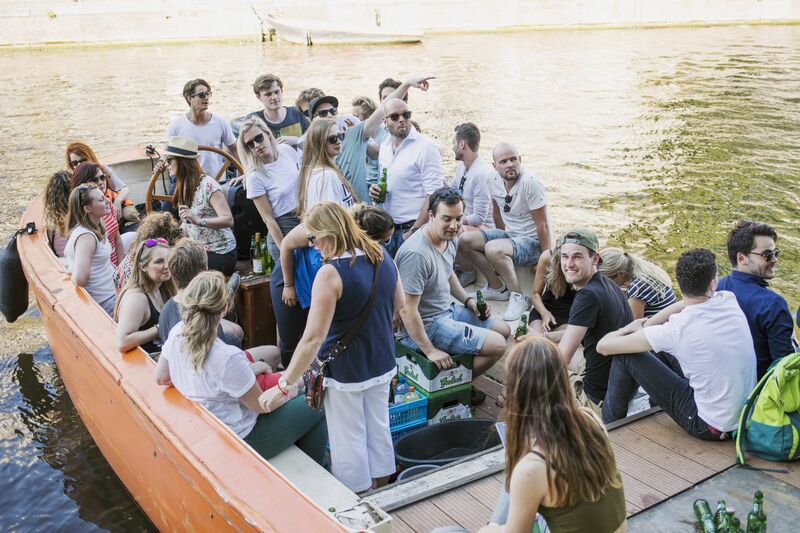 Furthermore, there are nice parties, boat rides and different office spaces to work in. There is room for everything you need and working at startdock helps you to grow your business. Also, you will find other people who can help you with stuff on which you are not good at yourself. I can recommend this place to everybody! "Really nice place to work"
The owners are really nice and very helpfull. Startdock feels like a family which welcomes everybody! The location is perfect, right in the middle of the city. I really like the friday afternoon drinks (Dutch: VrijMiBo) where all the different coworkers come together and share their experiences. Also the lunch which they organize is a nice place to get to know your fellow coworkers. It is a perfect combination of work and social life, and you can learn a lot from the other coworkers. Startdock really feels like a community and makes sure you do not only get a place to work, but also a networking space. Very chill environment and very friendly coworkers and staff. Highly recommended! Location couldn't be much better, canal view and close to all the attractions. I worked there for ½ a year while doing an internship with one of the companies that uses Startdock for office space. Good coffee, decent lunch buffet (but excellent if minding the price). Good social activities, such as; movie nights, wine tasting, boat tours, dart tournament, Friday bar. Over all a very very good experience, and great for people who needs an office for a fixed short or long amount of time. The managers even help me print out personal documents with their printers for no cost. Super service. "It's such an inspiring environment to do business! " StartDock is the place to be if you are searching for an affordable great looking place to get your work done in the city center of Amsterdam. The location of the building can't be any better due to it's location at the Herengracht next to Koningsplein. StartDock offers a great mix of vibrant community and workplaces because it's very easy to meet up with a lot of other tenant during lunchtime. They provide the opportunity to share and discuss business with others and know more about theirs. It is such an inspiring environment to do business, learn and grow and the facilities are great and affordable! I think it's the best place in Amsterdam! Go and experience it yourself! "Co-workspace met een goede sfeer!" Zoals de titel het al zegt is Start Dock een workspace met een goede sfeer. Op het moment dat ik er voor het eerst naar binnen stapte voelde ik mij er direct thuis. En dit gevoel werd door de aanwezige Start Dockers versterkt doordat ze me een warm welkom gaven. Start Dock ligt op een perfecte locatie in het hart van Amsterdam. En met een uitzicht op de Herengracht is het met mooi weer ook geen straf om binnen te zitten. Ook zijn de borrels & feestjes die regelmatig gegeven worden voor zowel Start Dockers als hun netwerk een aanrader. 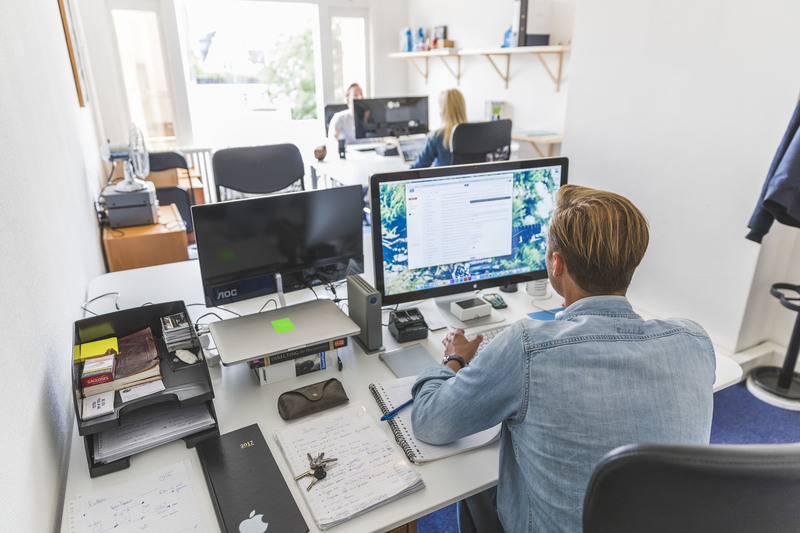 Al met al is Start Dock een top Co-workspace en kan ik het aan iedereen aanraden. "Community as a community should be!" StartDock is a great place to work and network with other freelances and startups! Also they generate amazing community events very useful for any entrepreneur to gain visibility for their projects or companies. The space is 6-star carefully furnished and covering all of your needs (free coffee, events, quite areas and social areas, good location, high speed wi-fi....) I would definitely recommend StartDock to any people looking for a coworking space in Amsterdam. I have heard they are opening a second space in Amsterdam and the Netherlands, and looking for new cities to expand their concept of coworking space. Wheather you need a hot desk, a private desk or a personal office, I would definitely recommend StartDock. "StartDock, the most inspiring coworking space!" If you are searching for an affordable great looking place to get your work done in the city center of Amsterdam, StartDock is the place to be! Do you aspire a good work/life balance? Well, at StartDock you’ll get the whole package. They assist you with everything you need. The other co-workers are very kind. You have a very productive environment to work in, but you can also enjoy from the social benefits the location offers. Their location is this beautiful old building right in the middle of Amsterdam by the canals and I just loved the easygoing atmosphere and personal approach they have their. The drinks were very nice and the people interesting. Inmiddels is startdock in Amsterdam mij al enkele jaren bekend. Hoor veel over hoe hard daar gewerkt wordt maar ook heerst daar een gezellige sfeer. Plezier op de werkvloer is van groot belang. Daar krijg je alleen maar energie van en dat kan ook weer prestatie verhogend werken. En wat een mooie locatie heeft dit mooie pand. Aan de Herengracht, een van de mooiste plekjes van Amsterdam. Het is een jong bedrijf met jonge ondernemers die elkaar helpen en inspireren. Iedere dag wordt een gezonde lunch geserveerd die aan een grote tafel met elkaar wordt genuttigd. En last but nog least wordt de friday borrel erg gewaardeerd. Geen twijfel mogelijk. This is the place to work. "mijn beleving bij deze review"
Geachte lezers aan mij wordt gevraagd een review te schrijven om uit eindelijk Start dock als nummer een te laten eindigen. zeer vreemd dat op de laatste dag van de stemming een zo groot verschil in stem telling heeft plaats gevonden .Dit riekt naar corruptie gelukkig is Thom niet van gisteren en heeft dit aan hanig gemaakt bij het comité die deze ver kiezing heeft uit ge schreven. Start dock moet winnen daar deze groep zeer voor uit streven en hard werkende mannen meer ver dienen dan een schamele tweede plaats. Van daar mijn review. Ik wens Start dock het aller beste toe voor de toekomst. I've visited Stardock serveral times in the past year. You can really feel a good atmosphere. The owners Johan, Thom and Stephan make you feel at home and the other dockers are always willing to help you further and to help each other further. I can give you several examples of the tight community feeling: the daily lunches with all the dockers, the Friday afternoon drinks, movie nights, interesting events with guest speakers, boat trips. The owners are succesfull in taking the term 'co-working' to the next level. 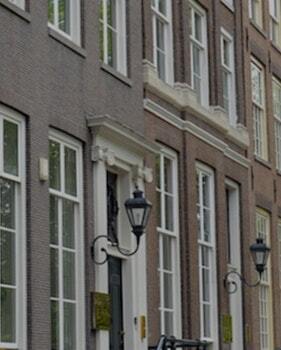 At last but not least, Startdock has the best location in Amsterdam, at the Herengracht, nearby Leidseplein! I visited StartDock on one of their organized Friday night drinks. It was very nice way to socialise and make network connections with other entrepeneurs. Their location is this beautiful old building right in the middle of Amsterdam by the canals and I just loved the easygoing atmosphere and personal approach they have their. The drinks were very nice and the people interesting. I've made some really useful connections. I still visit occasionally and I am planning to visit one of their organized lectures. knew Stephan (one of the owners) from before and he is so good at showing you around, introducing you to others and helping you in every way that you need. "Startdock, I recommend it to you al!" "Never have I met such an open, innovative, and warm community of start-ups! " Startdock is an amazing community with a unique but very encouraging approach on how start your own company. The facilities are amazing. Their canal house in Golden Bend Herengracht Amsterdam is absolutely stunning, well-organised, clean, yet very authentic. The Startdock crew are the most friendly open people you will ever meet in the 'hard' business world. I've been involved in the start of Startdock and I come back many times to join their events, conferences and lunches. Most inspiring is the enthusiasm that breaths in the work environment. Whenever you are in doubt about something there is always someone around that is open to new innovative ideas and will help you to go further than you could come alone. I have big hopes for this co-working space! StartDock is located in the heart of the city so everything is easy to reach. In the mornings, I like to grab a cookie at Stach. Very tasty. And there some really cool bookstores in the neighborhood for all the booklovers out there. Book a boat at Rederij de Nederlanden to make the best canal cruise you can have. The people at Startdock will make you feel welcome, so just go there and the relaxed vibe will do the rest. On your first day, don’t miss the group lunch! It will help you settle in with the group a great deal. Get acquainted with the other startups in a warm and cozy coworking environment. Right around the corner you've got Cannibale Royale, a burger place which serves food untill deep in the night! De borrels & feestjes van Startdock zelf zijn een goede manier om snel in de community opgenomen te worden. De Gieter, is a nice and small pub in the centre of Amsterdam. In the middle of the city centre the canals are beautiful and an amazing source of inspiration! blue amsterdam opposite of the flower market has the best view and cappuccino in town! The Friday night drinks and parties are amazing to connect with the Dockers and to have a good time. The vibrant squares "Leidseplein" and "Rembrandplein" are around the corner. You don't need anything else, you just need StartDock! Startdock is located on one of the most beautiful spots in Amsterdam City center, everything is close by! Herengracht café, right across the canal. Be open and don't be shy to talk. Whatever it might be that is in your way, you are surrounded by nice people who'll help you get comfortable at StartDock. Go to the bar/restaurant "Herengracht" there is a small garden in the back which is amazing to drink a couple of beers during the summer. Go to the organized drinks and other events and don't be afraid to talk to anyone working there. StartDock will be in touch with you soon to confirm. 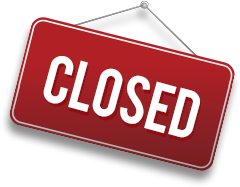 StartDock has received your membership enquiry and will be in touch with you soon.